I grew up thinking fashion wasn't something fun. What "fashion" was to the people living where I grew up was something along the lines of Juicy brand tracksuits, UGGs and anything with Tory Burch's logo on it. I didn't understand why people could possibly be interested in fashion because what I thought fashion was didn't interest me and I thought it was all like this. But I'm happy to say I have changed my opinion of fashion and it's all thanks to Japan! Japan has really strong traditions that are very strict about what you can and can't wear. For example, tattoos have an association with Yakuza, organized crime, so there is a big stigma against it. But because of strict rules like the ones against tattoos, interesting fashion trends evolve. In this case, tattoo tights, sheer tights with designs printed on them to resemble tattoos, have become very popular in Japan (see Avantgarde). A lot of people say they can really only feel like their true selves when they color their hair and dress how they want and the most welcoming place for that in Japan is Tokyo and Harajuku especially. There is a perception that everyone in Japan is open to that kind of style but that isn't true at all. Similar to how colored hair and certain piercings and tattoos are unacceptable in business situations in America, it's more or less the same in Japan just infinitely more strictly enforced with a stronger stigma. There are various publications both in print and online that take street snaps, photos of people whose style they like, and publish them. 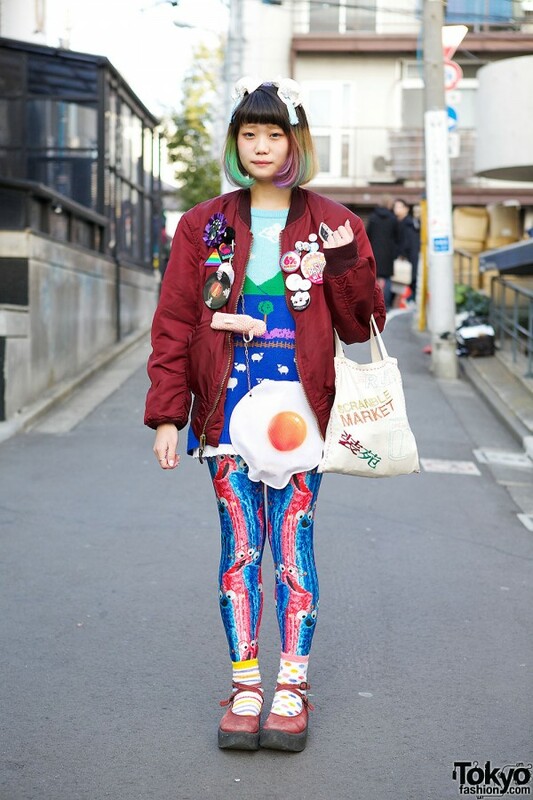 I have discovered the following people through street snaps on Tokyo Fashion and otherwise. I really love the way these people dress and I hope that you do too. Look how cute she is!! Kumamiki always looks amazing but one of my favorite things about her, besides how colorful all her outfits are, is that she designs her own clothing. Her clothing line is called Party Baby and there's a really cute video about it here. She also makes her own Youtube videos that are really cute but they're mostly in Japanese. Christina really stands out in street snaps not only because she isn't Japanese, but because she pulls off colorful Harajuku fashion so well! I especially love her yellow glasses. Christina has always been inspiring to me because as a Canadian, she moved to Japan to study Japanese and became so good at the language that she is currently attending Bunka fashion college here in Japan! I'm so excited that Tokyo Fashion is starting a video series on her too. You can watch the first part here! Chun's style is so cute! I followed her on Instagram immediately after seeing her photos. I really love the way she dresses and wish I had half as much skill in coordinating an outfit. Although Juria has kind of been on the down low lately, I remember her being one of the first people whose style I was really interested in. Her street snaps were always my favorite. I hope she makes a comeback soon. Elleanor's street snaps are really cute and I love the way she always has really unique accessories. She's really popular now for her video series through Tokyo Fashion. It's in English too so check it out here! Her videos are a really good way to start learning about fashion in Tokyo. I got to meet her while she was in New York (and again in Japan~) and she's really nice too! That's all for this post. I recently took a trip to Harajuku and went to a local festival but I want to make a video of the festival just iMovie isn't the same as it was 6 years ago when I last used it! I was thinking about using Youtube but I'll have to figure all of that out first. As always, feel free to ask questions/leave comments below or in my ask.fm! Omg, love your blog so much I am a new follower, can you check out mine please? :) I hope you like it. Ahhh yeah I really love her too. She's so cute and I love her burger addiction. It's so funny! I haven't seen a snap of her in a while. I feel like she's moved far beyond that for some reason with her clothing line.